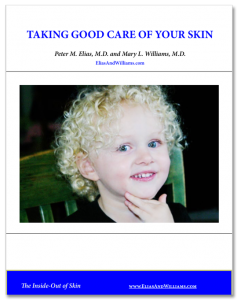 Our Research on Antihistimines and the Skin Barrier Featured on Allure.com - Elias and Williams: The Inside-Out of Skin by dermatologists and skin researchers Peter M. Elias, M.D. and Mary L. Williams, M.D. A new treatment for common skin diseases like psoriasis and eczema (or atopic dermatitis), or other skin conditions with a defective skin barrier, is the hope raised by recent work from the Elias laboratory and featured in Allure this month. These studies demonstrate that when antihistamines are applied topically to the skin, they improve the skin barrier. This suggests that creams or ointments containing anithistamines of the type that do not cause sedation as a side effect could provide a safe and effective way to treat inflammatory skin disorders caused in part by a defective skin barrier, like eczema and psoriasis.